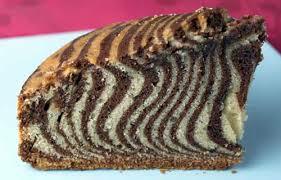 I’ve never heard of a zebra cake until I saw this online one day. I’m anxious to have an occasion to try it. 1. Grease and line with parchment paper, a 24 cm (9 in) round cake pan. Preheat oven at 180 (350 F). 2. Whisk together in a large bowl the dry ingredients, flour salt and baking powder. Set aside. 3. In another bowl mix the cocoa powder with 1/4 cup milk and 1 tbsp of sugar. 4. Mix butter with sugar until creamy. Add eggs one at a time and mix until well incorporated. Add vanilla extract. 5. With the mixer on low, alternate adding gradually milk and flour mixture until all is well incorporated. 6. Remove two cups of the batter and mix them with the chocolate mixture. 8. Bake for 50-60 minutes until a toothpick inserted into the center comes out clean. 9. Remove from oven and let cool for 15 minutes on a cooling rack before removing from the pan. 10. Serve as it is or top with chocolate glaze.